The son of an immigrant, Victor knows how it feels to be an outsider. The beneficiary of policies that embraced multiculturalism and inclusion, he’s committed to extending these opportunities to women. Philip says it’s a business issue. The goal is to retain top talent and expand the strength of the company. Ramon was raised by a single mother. Equality and fairness matter to him. Why wouldn’t he get involved? Bill believes there’s no reason why his son should have a better chance to succeed within his company, or any organization, than his two daughters. Sam was sick of standing by while his male colleagues degraded women. He didn’t want to feel afraid for his baby girl. For Justin, it was a no brainer. It was 2015, after all. The statistics are bleak. Only 7% of venture capital funding has been invested in female-led startups in the United States, and these figures remain low even as the industry grows and matures: between 2011 and 2013, only 3% of venture capital investment dollars went to companies with a woman CEO. It’s not for lack of trying: women are 33% more likely to found startups than men, however, according to a study out of MIT, pitches delivered by men were 60 to 70% more successful in generating funding than those delivered by women, even when the content was the same. In the highly male-dominated venture capital industry, fewer than 5% of decision-makers are female. So where does this leave female entrepreneurs? “For me, all of these negative stats added up to a really good opportunity,” says Susan Lyne, who left her post as CEO of AOL’s Brand Group in 2014 to found the AOL investment fund—BBG Ventures—which makes seed and series A investments in digital startups led by women. Hong Kong is an epicenter of business advancement, yet corporate gender diversity is still in its infancy. Su-Mei Thompson is guiding its growth. While women make up half of Hong Kong’s labour force, only two per cent of CEOs and eleven per cent of board positions of companies listed on the Hang Seng Index are occupied by females. There is, however, a small but powerful community within the country talking about women’s advancement. At the centre is Su-Mei Thompson. 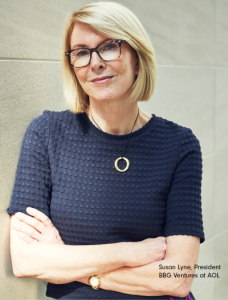 CEO of The Women’s Foundation (TWF)—an NGO dedicated to improving the lives of females in Hong Kong through research, community programs, education, and advocacy—Thompson is passionate about tackling issues of inequality in boardrooms and communities. Her commitment extends beyond TWF to the 30% Club, a group she founded to advocate for increased female representation on corporate boards, and The Hong Kong Equal Opportunities Commission, of which she is an active member. “I always knew I’d end up doing something with social impact,” says Thompson, “From an early age I remember saying I’d like to run an airport or a hospital.” While she hasn’t done either of those yet, the 47-year-old has had an impressive career, including senior management positions with The Walt Disney Company, the Financial Times, and Christie’s.